Egyptian President Abdel-Fattah al-Sisi on Monday wrapped up the 32nd African Union (AU) summit of heads of state and government at the AU headquarters in Ethiopia’s capital, Addis Ababa, with a pledge to work for the welfare of African people. Al-Sisi, who took over the rotating one-year-term AU chairmanship from Rwandan President Paul Kagame, said that over the next one year he would energetically work toward achieving the goals set by the AU during the summit. These include putting into force the Africa Continental Free Trade Area (AfCFTA), efforts to reform the UN Security Council, rehabilitation of refugees and Internally Displaced Persons (IDPs) and providing employment to the continent’s large young population. The AU revealed on Friday that various conflicts across the African continent have left 20.8 million people displaced. “The 32nd AU summit theme on refugees and IDPs showed how the displacement of people can create social, security, political and economic challenges in the continent, hence this will be my focus in the next one year,” said al-Sisi. The Egyptian president outlined a vision of economic integration in Africa that he said can be a solution to the multifaceted problems facing the continent. On top of his list of African economic integration schemes is the AfCFTA, which is expected to formally start operations during the next AU summit in Niamey, capital of Niger, in July. “Many African countries are already grouped under Regional Economic Communities (RECs), my chairmanship will focus on how RECs can be a vehicle to achieve wider continental economic integration,” said al-Sisi. “The start of operation of AfCFTA will not just ease movement of goods across African borders, but also facilitate the movement of African brainpower across the borders of African countries, adding social importance on top of political and economic benefits,” he added. Al-Sisi said he will also focus on relatively new challenges the continent is grappling with including climate change and terrorism. “We need to have plans that match with the scope of challenges terrorism and climate change pose to the continent. As such, during my period I will focus on mechanisms to fight climate change and ways to achieve AU’s silencing the guns by 2020 initiative,” said the Egyptian president. “I will in particular vigorously fight the terrorism threat in the continent, that have left large areas of Africa suffering from political, social, economic and security problems,” he further said. 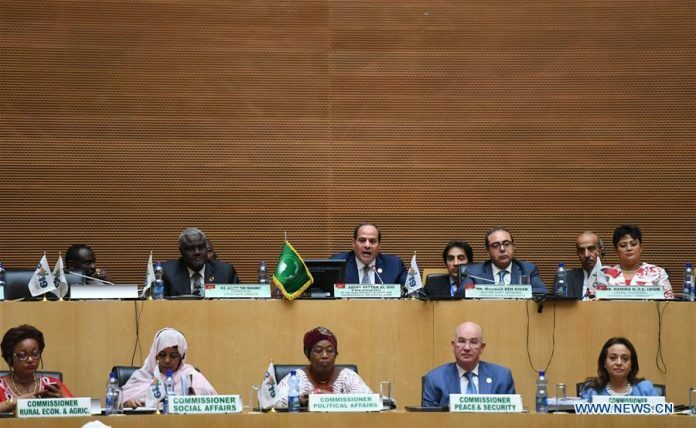 Al-Sisi also said the 32nd AU summit had established an agency for medicine, a center for women’s and girls’ education and other instruments intended to achieve a holistic approach to Africa’s numerous challenges.